Get started learning how to play piano by ear today! It's easier than you might think. Here is a mini guide with a step by step tutorial for beginner pianists to learn how to play piano without sheet music. How Do You Play Piano By Ear? To play by ear means to pick out pieces that you know or have heard, without reading sheet music. Playing your own compositions and improvising are also wonderful ways to create music and play by ear. Some people just seem to naturally learn to play piano by ear easily, while others need to work harder. But as with everything else- it takes practice to make perfect. Here you will learn how to get started! The trick is to start very simple. Pick a very easy piece that you know very well- let's say “Hot cross buns". Too easy? Pick anything you like, but start with something really simple-otherwise you might just give up. 1. Listen to the melody several times. 2. Play any key on the piano, and search until you find the first note of the melody. 3. Then find a few more notes. You can either hum along, which is the easiest, or keep playing and listening to segments of the recording. 4. Keep picking out the melody of the song one little bit at a time until you have it all. Focus only on the melody, not the background accompaniment. 5. Mistakes are allowed! Make as many mistakes as you need- you will actually learn to find your way around the keys of the piano better if you "fiddle around" a bit. Once you have found the melody, play it several times so you learn it well. You can play only one hand- often the right for the melody, or both, or take turns. It gives you some extra practice. The melody needs some accompaniment, right? OK. Find the note that finished your piece, the very last note. Does it sound as if that is the end of the piece? This note is called the Tonic. This is in most cases the first note in the scale your little piece is made from. We will call this note I (1). Now count up from this note (being 1); the next up is 2 and so on. Find the IV (4th) and the V (5th) note. Please note: If your melody had some black keys in it, then you might have to alter the bass notes to a black key right next to it too. Listen to what sounds best. With your left hand play the first note (I) with your fifth finger (your pinkie), your fourth note (IV) with your 2nd finger, and your fifth note (V) with your first finger (your thumb). Practice playing them one at a time. Play the melody you learned with your right hand. Test the bass-notes you learned with your left hand- one at a time- together with the melody. See together with which melody notes they fit best. 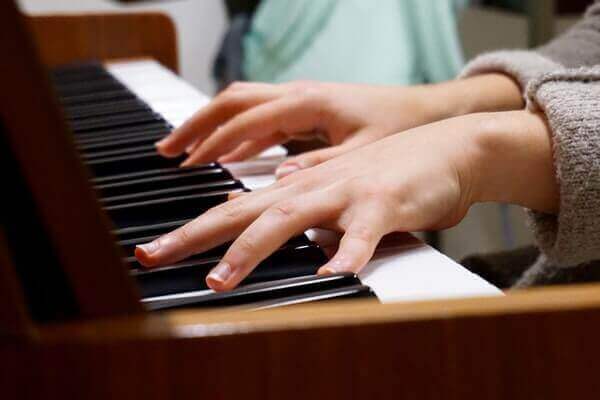 Keep the left hand notes longer, but listen to where you have to change or it sounds ugly. Stick with only these three bass notes for now, though (I, IV and V). You can also try to sing along the melody with your left hand bass notes. This is a great exercise in ear-training, and you are now playing piano by ear! You can get much more ear training practice with this software. Continue to play piano by ear and pick out other songs (or make up your own!) that you like, but remember to choose very simple songs at first. Here is a method for learning how to play piano by ear. The I, IV, V (Roman Numerals) formula works for many, many songs and you could also play piano chords this way; just build the bass note with a third and a fifth to a chord in root position.